Is it a Good Idea to Create a Universal Password? It’s pretty obvious that bloggers sign up for different sites to take various benefits and services. Creating multiple online accounts demand more passwords and login data as well. Almost most of the users including me, to make this hurdle easy, we create a universal password to avoid frustration. But, Is it really good idea to use one passcode for all accounts? Let’s discuss further more. Some of those sites are very serious and revealing our password on them can be very dangerous, like our profile on the bank account or online service for the payments. On the other hand, we have profiles on social networks and mail services which also can be interesting for someone who wants to steal information about us. Choosing a secure password can save our private life, but sometimes even a life. According to surveys, many people are acting like they don’t know for these risks. They put a simple password, usually made of some information from their lives and some of them even give them to friends or partners. For someone who wants to break your password, having information about your pet or city of birth can be fascinating to enter your profile. Even 38% of people have simple password made of the numbers 1234 or QWERTY. Do you realize how serious this is? But, some serious hackers use many different methods to steal the password from you. There is a believing that if you want to keep your password in safe, you should change it very often and check if any of them are already broken in some other site. It happens when hackers broke the site with other passwords and simply saved for other sites and profiles. People usually use the same for all cases. So, there is a question – how to make the perfect password, but more important, should you use the same password for all sites as the universal password? Experts and hackers said – yes, it is a good idea, but, with some adjustments. Having a good password is always better than having the different ones for every site separately, but that can be dangerous if you don’t prepare the great password which no one can break and you’ll not forget in any circumstances. → How to Make the Great Password? Using a pet’s name is useful only for the security question, but even in that case, you can imagine the name which no one can know. If your first pet has been called “Jack,” you don’t need to use exactly the same name for it, because your partner or a friend can know it. Make up a new name, which no one could know. An ideal password contains the letters, numbers, phrase or sentence which is known only to you. You can put together randomly chosen words with numbers in between them, which will look like not clearly related, but easy for remembering. Put numbers between the words, but be careful, you need to remember them and their order, so choose something which you can recall if it’s needed. You can use simply 1, 2, and 3 between the words, but also a date or some special things for you. When you imagine the perfect password, think about the persons who will use your laptop or go to your profile, about the friends and a partner. A partner can be ex one day, you know, and if he can suggest the dates or information about you, that can be dangerous. So, avoid all obvious numbers, data, cities or favorite places. You should also avoid something from the present moment. It seems funny, but if you choose the present date for the password, that can be a problem for a couple of months. Many people are justifiably afraid of the forgetting the password. Especially with those recommendations to combine words and numbers in some weird and not logical order. In purpose of having a safety password and future recalling, some people tend to write it on the paper and save in the hiding place. That can be good in case that you know where you put it, and have a place for it. Keeping password is like saving the credit card or self-phone, you need to keep it in a special place which no one knows of it. Some experts say that it’s much better to remember the system you use to make a password. If you’ve chosen random words, it will be hard to recall it, but if you’ve done it by leading a system, you’ll always know the password. That means that you need to choose words which are somehow connected, but only in your mind. For example, the city where you’re born, the last two numbers of your birth year, the first friend you have in childhood, the summation of the last two numbers from the birth year and your middle name. If you are afraid that you’ll forget this complicated password, you should make a way of recalling it, by finding an association for it. The example above can be a phrase – my childhood, from the beginning to the friends. You can also put some marks as some kind of the road signs. This type of the password is usually called “passphrase” because it is a combination of the signs readable and understandable only for its maker. 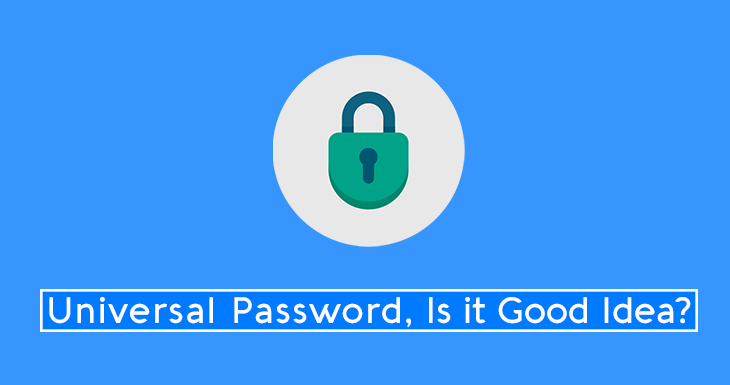 If you are still not sure that it is good enough, combine it with the capital letters, question and exclamation marks and others to make your passwords more muscular. As we said, the universal password is like a credit card, only yours. You should keep it like it’s the most valuable treasure. If you really need to write it, put it somewhere where it’s safe and only known to you. Don’t forget that there are people who can abuse your secrets. Friends, partners, colleagues, and can be ex. You’ll not feel safe if they know your private information. Internet life is like real life – there are possible enemies and fraudsters on the every corner. So, you should take care of this ironic fact about online life and try to avoid universal password. Tom Jager is an expert blogger situated in London. He currently works at Royal-Essays. Tom stays always on trend in digital marketing, blogging, and social media. You can reach him on Google+ or Facebook.